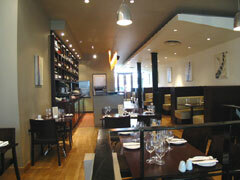 This restaurant has a very relaxed bar area which is a good place to gather before or after your meal. The bar stocks over 25 English and continental beers. The wine list is comprehensive and has been expertly compiled by a Master of Wine to compliment the food. Covent Garden Grill is the perfect spot if you are shopping, sightseeing, or simply in need of a little refreshment. A pre-theatre menu is available, but you may like the atmosphere so much you won't want to leave.